Branding your business can be difficult if you just don’t have the funds – and you know what? That’s OK – it really is. You could go on and on with that list. Branding is so important in order for you to differentiate yourself in an ever-growing busy online market – how busy is that newsfeed of yours? So you’ll know just how important a brand now is. Your brand is how people see, hear, feel, think, read, believe, hope and wish for from you and your business. It’s the whole impression you give, from your logo, your videos, your fonts, your services, your products, your brochures and your content. Do you need a brand and can you have a brand on a tiny budget? Your visual brand is your logo, colours, fonts, images, business name, printed marketing, shapes, forms… it’s every single visual element of your business, it’s the super exciting part where all your fun and creative decisions are made as you create your business – your shop front. Design and visual branding is what people see – the tangible element if you like – it’s here you get to make the right first impression. Think The Greatest Showman – you are setting the stage. 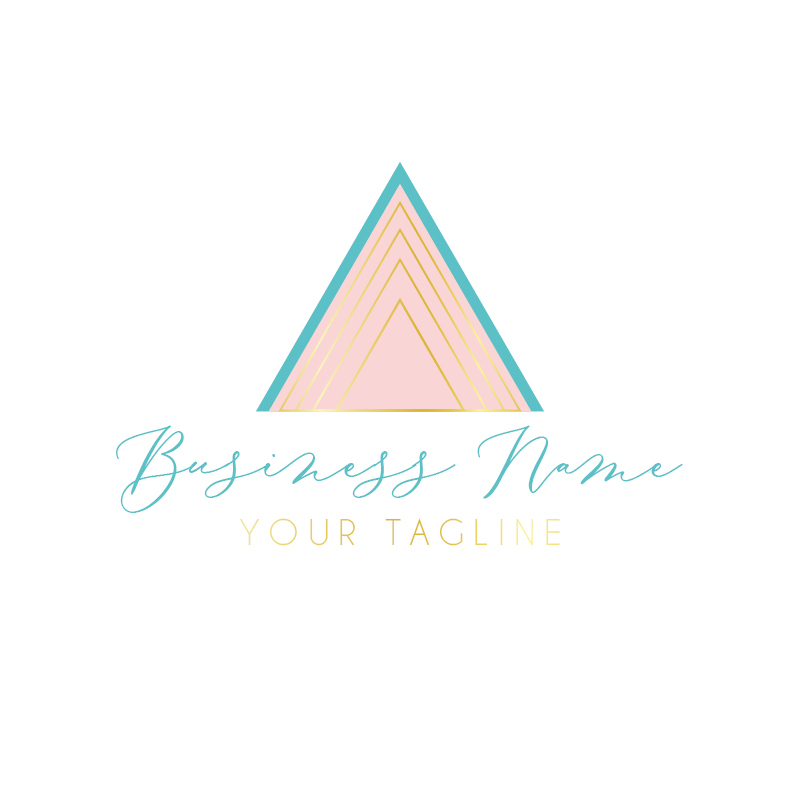 Throughout time your logo and your visual branding will build brand recognition – so consistently posting, blogging and being present in your business will establish YOUR look and feel and your personality, so when people are scrolling through their newsfeed, they know it’s you. 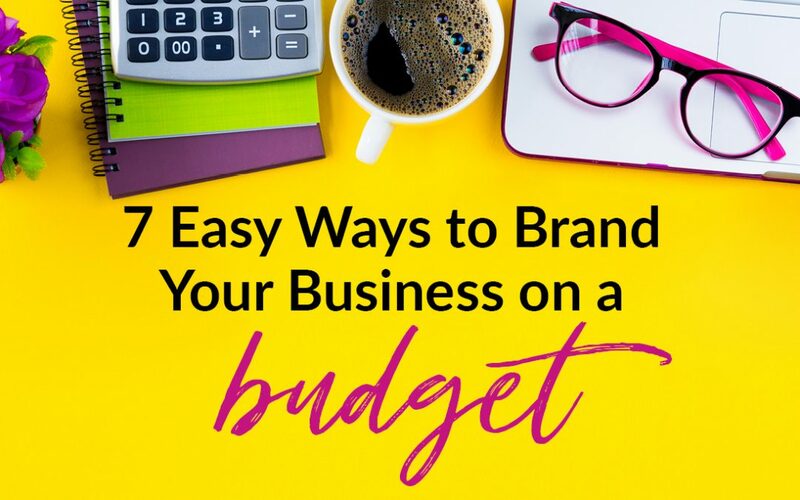 But you’re here because you want to know how to brand your business on a budget, how to create that scroll-stopper of a brand even when you have a very limited budget. You can buy these for lots of places like Creative Market and Etsy. But a lot of graphic designers who specialise in branding also sell off logos too. 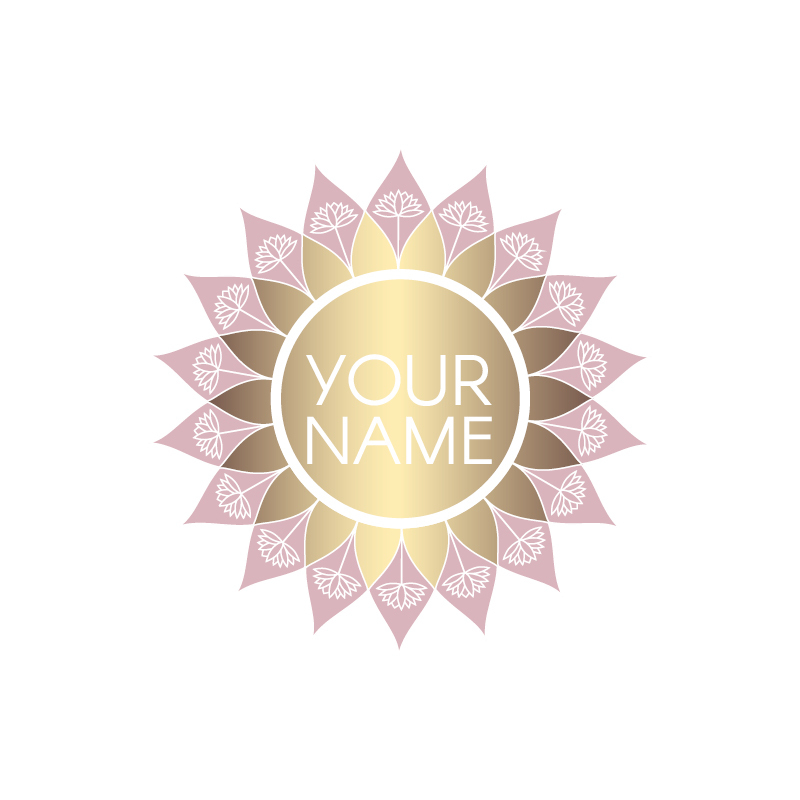 I have a logo shop on my website where I sell off all the logos that I have sitting on my system that have never been used. This is a perfect way to brand your business quickly and on a budget. You can browse the logos that are ready for purchase NOW. 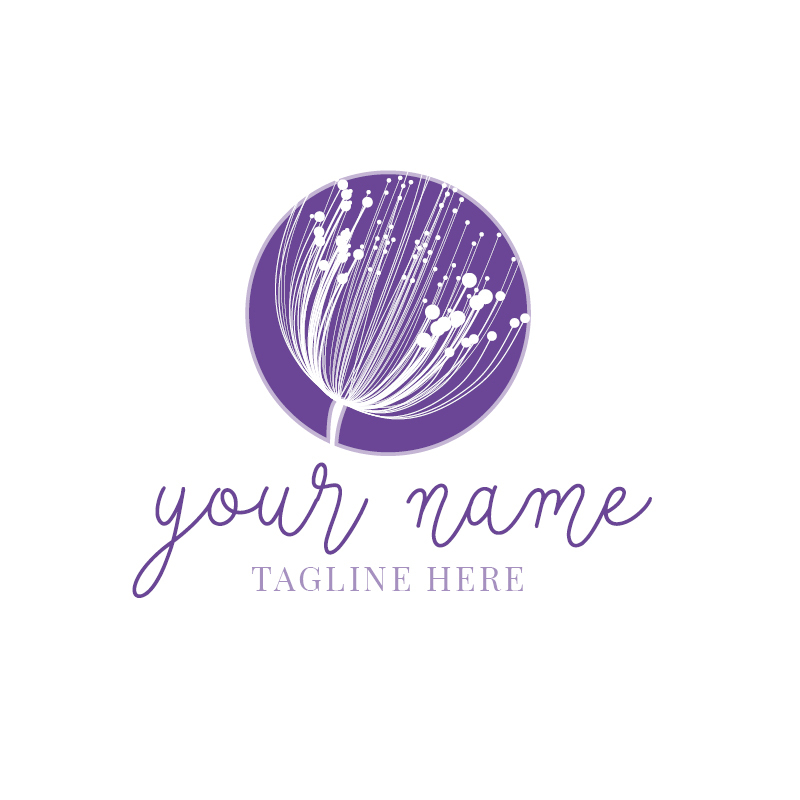 It might be that you’re just starting up and just need a logo – what you get is it personalised with your biz name, you can add a tagline if you want plus you get a mini style guide too – all from me, a super experienced and awesome branding designer. Canva is an online design tool. It’s free, yes, you read that correctly. They do also have what they call ‘Canva for Work’ at around £10 a month, but the free version has SO many features that you don’t need it if you’re just starting out. It’s genius and it’s going to make creating the graphics for your business A COMPLETE DREAM. And even logos… yup I said it, logos – hundreds and hundreds of FREE logo elements. NOTE: you cannot trademark your logo if you use these elements but if you have a super tight branding budget then THIS is a genius way to get started – right now. If you want to learn how to use Canva confidently and with ease then you can purchase my Create in Canva with Confidence course to show you how to create your logo, add HEX codes, what HEX codes are, font pairing, how to save your images, image types, create eye-catching ebooks, FB ads, mockups – the course covers EVERYTHING… here. Or grab my free Canva course to find out how to get started with Canva. In this mini masterclass, I show you how to design your beautiful content for your brand all with FREE – Canva! How to jumpstart your designs so you’re always consistent and always on brand. I know that when it comes to picking fonts for your brand it can often feel like wading through treacle. There are soooooooooo many to choose from and picking just the right ones that go together can be confusing. So here’s a couple of tips to help you pick just the right fonts, so you can make font choice so much easier and quicker. Limit yourself to two fonts for your logo design – one for the main font and one for the tagline. Pick a yin and yang font – two opposite styles of font – one script and one plainer font or one plain and one more elaborate. Use fonts from the same family. So for instance… Vayentha is a free font and comes in 2 styles – making is so much easier for you to combine the two. In a nutshell, choose one font that has heaps of personality and mix it with another that contrasts and is more sophisticated or demure in nature – it’s all about balance when picking fonts. Buying fonts can be quite expensive, from around £10 upwards to £400. Here I’ve listed some of the best sites you can download font from and are 100% Commercial Free fonts. Hype for Type: https://www.hypefortype.com – sign up to their newsletter to get 30 free fonts. Remember to check the licenses on how you can use. You may have to pay to use it for your business but not for personal use – just check to be sure. Hungry Jpeg: https://thehungryjpeg.com – they give free fonts away weekly and monthly for commercial use. Sign up to take advantage of this. Urban Fonts: http://www.urbanfonts.com/free-fonts.htm – this link takes you directly to the free fonts – again check the licenses just in case a sneaky paid for one made its way in. Font Spring: https://www.fontspring.com/free – this link takes you directly to the free fonts – again check the licenses just in case a sneaky paid for one made its way in. Creative Market is an online downloading website for businesses. It hosts individual sellers – a bit like etsy – but only sells downloadable ‘products’ like fonts, graphics, texture backgrounds, add ons for websites and design programs, photos and logo and branding kits too. They claim to have over 110k templates to download! You could get lost here, be careful that you don’t fall down the Creative Market Warren Hole (yes that’s a thing). Finding just the right image for your visual content can be time consuming, frustrating and expensive. The package I have with Shutterstock costs me around £180 a month. However, there are some incredible sites out there which offer commercial free images. If you haven’t heard of Pixabay yet, then let me introduce you. Pixabay is a website offering FREE images, video, graphic elements, icons and textures – and they all FREE. Perfect for your website and all your marketing material especially for ebooks, social media posts and blog images. There are hundreds of contributors from all over the world so the variety on offer is outstanding. Other sites like Unsplash and Pexels are also excellent. Spend 60 minutes each week pulling together images that represent your brand’s look and feel. Do this at least once a week so you can quickly pull images for any marketing you do like memes, articles, posts and tweets. This will save you heaps of time every week. And if you have the time – make some Instagram templates up too for later. Jet Set Websites don’t need any coding knowledge or designer skills in order to launch your professional website. They are totally customisable so you can style your brand and business yourself! To grab a Jet Set Website pop here to have a browse at live sites and templates to jump start your business. DIY your brand from bland to beautiful. My Beautiful Brand Bootcamp is a really practical, amazingly simple programme that walks you through the basics of branding and design without overloading your brain. It’s a home study course that you can do at your own time, in your own way, find your feet and learn the very best tools, tips, tricks and branding advice to design your very own brand. Beautiful Brand Bootcamp is guaranteed to get you exactly THAT – a brand that you love, a brand that connects with your customers, that aligns with who you are, radiates your personality and will fill you with sheer joy when you market yourself. We’re gonna Boost Your Brand in the first module – it’ s jargon free and non-confusing. You’ll learn what branding does and how it adds massive value to your business. Workbooks, videos and practical guides are included to help you discover the very essence of you and your brand and how to inject that into your visual branding. In summary, you CAN brand on a budget. There are lots of tools and resources for you out there to design a brand that you love. Branding is what will spring your business into action – even when you have a limited budget – you don’t ever have to be without. Design your brand and start building your business and eventually, over time, you’ll know when you’re ready to take your business to the next level – when you have the means to invest in a branding designer – that’s when. Did you find this blog helpful? Let me know in the comments below.